Be Celebrated at Relay. An important part of the American Cancer Society Relay For Lifeï¿? is the celebration of nearly 11 million cancer survivors who are alive in the United States today. Anyone who has ever battled cancer is invited to celebrate life by joining your local American Cancer Society Relay For Life. Find a survivor lap near you. Survivors, caregivers, friends and family are our honored guests! Each step we take together draws us closer to a cure. Relay For Life is an overnight event that raises awareness of cancer in the community and raises funds to fight cancer. Teams of friends, neighbors, families, and co-workers commit to keep at least one member walking on the track...because cancer never sleeps. The Survivors' Lap symbolizes the courage of survivors and their families display every day. Take this opportunity to have your community support and honor you and in turn support others who are facing this disease. Meet and talk with other Survivors...some in treatment; others who have been survivors for decades. Learn about services and programs the American Cancer Society has to offer to cancer survivors and their families. Experience the healing and strength that comes with being around others who have survived cancer. 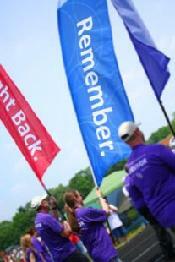 Participating as a survivor at Relay For Life is free! You do not need to raise funds to join us in the celebration, just come to the event and register at the survivor tent. While every cancer experience is different, there are some common threads that tie survivors together, such as the immeasurable strength it takes to face challenges head on. Celebrate your personal journey with others who have walked a similar path at the American Cancer Society Relay For Life, and find other ways to fight back and make a difference in the lives of those affected by this disease. Send ecards to other cancer Survivors, friends and family letting them know about Relay and encouraging them to join you or find an event in their community. Spread the word! Help us give hope to people across the country and around the world by sharing your story. It's stories like yours that provide comfort and courage to others whose lives have been touched by cancer. Teams are made up of 8-15 people who share a passion and commitment to raise money throughout the year. Teams can be composed of friends, families, co-workers, churches, social clubs, small businesses...and the list goes on. Team Captains and Team Members are the "foot-soldiers" in the battle against cancer- raising funds and awareness to fight back. We can provide you with the most up-to-date information possible on any type of cancer, treatments and clinical trials. Search our Web site, http://www.cancer.org/, for information on cancer and resources in your area, or call one of our experts at 1-800-ACS (227)-2345, day or night. Find information on specific types of cancer, including early detection, prevention, treatment, staging, clinical trials, new research advances, and medical references and resources. What treatment is best for you? Which methods have proven to be most effective? Here you can find answers to your questions, plus learn about what to ask your physician, what's new in research, and what you can expect after treatment is over. If someone you love has been diagnosed with cancer, you may find yourself taking on new, unfamiliar responsibilities as you help them through treatment and recovery. Taking care of a person with cancer is an important, and sometimes difficult, job. In this section you'll find information and resources to make it easier. Here you'll find medical information, treatment decision tools, news updates, and support resources. You can also read about survivors' experiences, find hope, and inspire others. No one need face cancer alone. We are here to provide support every step of the way, from the time you schedule a cancer test through recovery and beyond. We know what you are going through and we can put you in touch with others who can speak from experience. Check out these American Cancer Society support groups, services, and events for support, information, and ideas about how you can help fight cancer. Find local programs and support services that provide assistance. Tell us what kind of resources you're looking for; transportation, medical equipment, support groups, health care services, and more. For a quick, easy way to learn important facts and practical tips about cancer and related issues, participate in our interactive online program, I Can Cope—Online. Find information about the types, diagnosis and treatment of childhood cancers as well as resources for parents, siblings, and friends. Having cancer is hard, finding help shouldn't be. We can answer questions about insurance, rides to treatment, wigs, and much more. We are here to help with day-to-day issues and to ease the burden of patients and caregivers. Every day thousands of cancer patients need a ride to treatment, but some may not have a way to get there. If finding a ride is a problem for you, we may be able to help. As a cancer patient, you may have financial resources available to you, including health insurance, government programs, disability benefits, aid from voluntary organizations, and living benefits from life insurance policies. If you have no medical insurance, there are other options. Reach to Recovery volunteers are breast cancer survivors themselves. Volunteers can meet with you face-to-face or over the phone to give you and your family the support and information you need to cope with a breast cancer diagnosos. Man to Man volunteers hold free monthly meetings where men facing prostate cancer support eachother and exchange information through treatment and beyond. A program that teach people in active cancer treatment ways to help with the appearance related side effects of treatment. The American Cancer Society's catalog and magazine for women offering helpful articles and a line of products made for women fighting cancer.